Protect your most precious possessions - choose Health Smart Windows® made with Super Spacer® for your home and family. What is the Super Spacer®? Super Spacer® is a flexible, silicone foam spacer that provides the maximum in perimeter insulation for sealed insulating glass units. It features a pre-applied adhesive that bonds to the glass with a continuous vapour barrier backing. It retains its flexibility over a wide temperature range, has excellent resistance to ozone, UV light, wind load and barometric pressure. 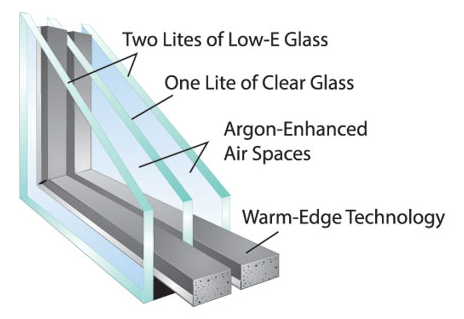 We choose sealed units with this NO-Metal Advantage because traditional metal spacers will conduct heat and cold – causing condensation at the edge of the glass. The edge of a sealed unit or (IG unit) is the most vulnerable part of the window to heating and cooling losses, condensation and frosting. Super Spacer® contains no metal and is one of the most thermally efficient spacers available on the market today. The all foam formula of Super Spacer®r blocks the heat flow at a rate of 1500 times more than that of aluminum spacers. Providing you with one of the best thermal performances in the industry. This means lower energy costs, less condensation/frosting and reduced chances for mold growth. With improved sound absorption over traditional metal spacers, No-metal Super Spacer® is a huge help in keeping your home quieter. The closed polymer foam transmits very little sound compared to aluminum or less metal warm edge spacers. Super Spacer® expands and contracts and always returns to its original shape. Rigid spacers do not accommodate the natural expansion and contractions which can result in stress cracks or sealant movement that can eventually lead to seal failure. Our all foam formula offset the effects of temperature changes, barometric pressure, wind load and glazing pressure. The end result is LESS seal failure and fewer stress cracks. Super Spacer® features superior Argon gas retention. Super Spacer® units can withstand the 140 F/60C temperatures, 95-100% humidity and constant UV bombardment in the worlds toughest durability test – The P1 Chamber. For the most energy efficient and durable windows with added benefits of improved sound absorption and less chance of condensation, choose Super Spacer® for Your home and family. Paired with high performance glass, that's the Health Smart Windows® advantage. 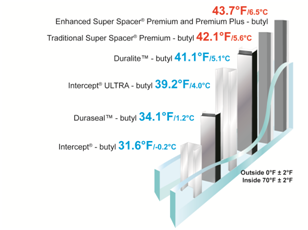 **Did you know...Research done by Health Canada found that Super Spacer® helped IG units(sealed units) stay in the optimum low humidity zone that prevents mold and bacterial growth. Too much condensation in your home can lead to more than bacteria and molds. In can increase the likelihood of fungi, viruses and mites that cause respiratory infections, allergies and asthma.